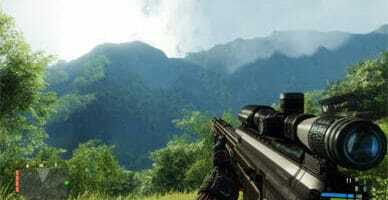 If you’re a PC gamer, you’ve probably had tired eyes at some point. Yes, those 4 AM Overwatch sessions probably didn’t help with that, but it’s far more likely you were experiencing eye strain from your monitor. So what can be done to fix this? A new monitor? Giving up games entirely? Thankfully, the solution is much simpler: just wear gaming glasses during those extended marathons. We’ve found some of the best gaming glasses on the market for your consideration so take a look at them below. Before we get started with our reviews, let’s take a moment to talk about gaming glasses, what they are, and how they work. A thorough understanding can help save you money and prevent you buying low-quality gaming glasses that do more harm than good. How Exactly Do Gaming Glasses Work? Your computer monitor produces mostly blue light. Now, it’s a little-known fact that blue light is a contributing factor for eye strain (it can also keep you up at night, but that’s just another side effect). Simply, gaming glasses filter the blue light so that it’s easier for your eyes to process, thereby reducing eye fatigue and allowing you to game for longer. You might think that because gaming glasses have a yellow filter, they make games look weird. Well, actually, this filter helps the colors pop far more than they usually would. This is especially good in fast-paced games where color is used to distinguish teammates from enemies. And it’s not just blue light that these glasses reduce – they also take care of a good deal of blur and glare. In most cases, unless you’re already experiencing eye problems while gaming, you probably don’t need gaming glasses. That said, because of the popularity of streaming and eSports, more people are finding out too late the impact that long periods of computer use can have on their eyes. If you regularly marathon games, play professionally, or game after working on a computer all day, we would recommend you pick a pair of gaming glasses up. In the worst case scenario, you don’t need them, but best case, they allow you to feel better, sleep better, and of course, reach your peak gaming performance. Now, not many people know that gaming glasses are a thing. This means that most people will be looking for inexpensive pairs just to try out before making a judgment one way or the other. The following products are the best gaming glasses on the market for less than $20. First up we have the ALTEC VISION glasses. These are a fairly ordinary looking pair of glasses but they are more than capable of handling all of the day to day computer work you experience. For around $15, that’s not bad at all. So let’s take a second to talk about aesthetics. The single upper rim of the ALTEC VISION is made stainless steel and the legs are plastic with a faux tortoise shell design. The lenses have a slight yellow tint to them, but it’s far more subtle than some of the other glasses on the market – in fact, these could almost pass for regular old eyeglasses. ALTEC VISION claim that these glasses block blue light, UV light, and glare while letting more than 90% of visible light through. This means that the objects on screen won’t be noticeably darker than before, but your eyes will definitely be able to tell the difference. Next, we have the FeatherView glasses from Trust Optics. These costs around $10, so they’re very affordable and look far more natural than the ALTEC VISION glasses thanks to their almost clear lenses. So how do they hold up? Well, the first thing you’ll notice is that they have a slight magnifying effect. This can be a little disorientating at first, but you’ll quickly become acclimatized to it. Also, the lenses reduce the strength of the blue light by up to 40%, which is decent, if not exceptional. The frames are very plain. They’re black and rectangular shaped, with royal blue legs. While there are glasses available that do a better job at eliminating blue light, they tend to be far more obvious whereas these allow you to blend in at work. As such, they’re less for gaming and more for general office wear. Our last budget pick is the GAMMA RAY 801 glasses. Now, these blend style with all the health and productivity benefits of high-end gaming glasses. Their horn-rimmed style is attractive, but these glasses offer a lot more than just aesthetic appeal. The 801s completely block all UVA and UVB light. Additionally, they greatly reduce the amount of blue light that makes it to your eyes and you can even select from a few magnification options if you’d like. With a price of around $10, this is pretty exceptional, but what else do they have to offer? Comfort, for one thing. The frames are nice and light. This means that they remain comfortable even after extended wear. They also come with lifetime breakage protection and a 90-day money back guarantee so you can try them risk-free. Really, what’s not to like? If you’re comfortable spending a little more money on a pair of gaming glasses, you can find some that protect your eyes even more. Better still, these can actually improve your performance by removing much of the motion blur and allowing you to focus on the task at hand. Let’s take a look at the DUCO Optiks 090s. These have a classic, professional look with a polymer half-rim and lightweight frame. So, what do they do to justify their price of around $30? One of the first things you’ll notice is the slight amber tint of the lenses. Similar to the other products we’ve seen, these drastically reduce the amount of blue light that passes through, but they also help protect your eyes from UVA and UVB light. This prevents not only eye strain, but also dry eye, which is great. In truth, most of your money goes on structural stability. The 090s have multi-barrel hinges that allow them to fit a wider variety of face shapes. This prevents them from bending on larger faces while also preventing them from becoming uncomfortable. In fact, you can even wear them with a headset. The next glasses from Micron are another pair that almost pass for regular eyeglasses. They have a very slight yellow tinge and while this makes them useful for protecting your eyes from overhead strip lights, the blue light reduction is lower than some others, at around 65%. That said, these do a great job at eliminating UVB light. Their anti-glare coating is fantastic for those working in a traditional office. These harsh lights can cause everything from distraction to migraines, so it’s good to see a product that focuses on allowing you to work to your full potential. Now let’s talk aesthetics. These glasses are rectangular and come in four different styles. There’s a faux-tortoiseshell design that we think is particularly nice, but one thing they all share is their ergonomic shape. This ensures that you never feel uncomfortable, even after hours of use. After all, these glasses are intended to help, rather than harm you. 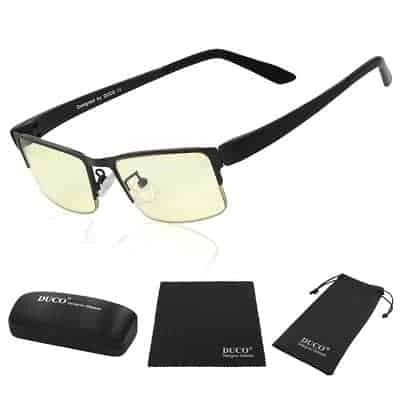 Our next pick is another DUCO product, and that’s because they more or less dominate the gaming glasses market. However, their glasses are always high-quality and the DUCO 302s are no exception. So what do they offer for the money? These are a fairly plain pair of glasses, but they have excellence built right in. The lenses are made of an ultra-pure material so there’s no distortion, and they do a great job of eliminating harmful light and glare from your vision. The frame is particularly good. It’s made of a flexible, shatter-proof material and it even offers the option to fit your own prescription lenses at a later date if you’d like. This model is also covered by a year’s limited warranty, so if there’s a manufacturing fault, you won’t pay anything extra to have them replaced. Overall, these are some of the most customizable gaming glasses around. They do a good job at protecting your eyes and are fairly inexpensive so really, what else could you ask for? The following products are more expensive than any we’ve covered but we believe they offer functionality that makes this extra investment worthwhile. 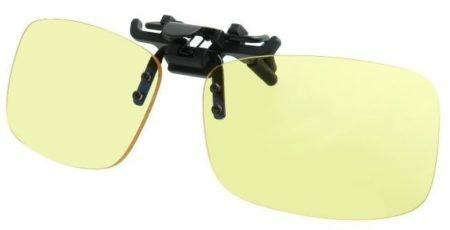 If you’re a serious gamer or are looking to take it to the next level, the glasses below would be an excellent choice. Priced at around $45, the Gunnar Optiks PHA-00101 glasses are a little pricier than their rivals. 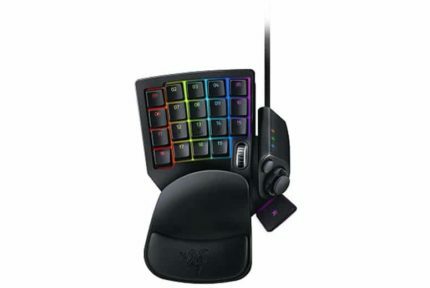 However, they’re good enough to be officially endorsed by Major League Gaming and come in four striking colors so they already have an edge over the competition. The Gunnar Optiks PHA-00101 glasses use their amber lenses to increase the contrast of your screen, thereby allowing you to more easily distinguish elements of a game during those clutch moments. Of course, blue and UVB light is greatly reduced, and there’s a hard coating on the lenses to help prevent scratching. The frame is made of stainless steel. This allows it to flex and fit the shape of your head while keeping the overall weight down. The nose pads are adjustable for greater comfort and the temples are slimmer than most to allow for easier wear alongside a gaming headset. 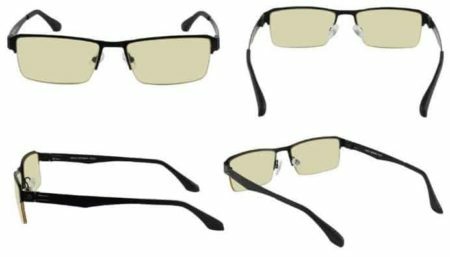 In short, if you’re planning on competing professionally, these are some of the best gaming glasses available. At around $25, the GAMEKING CLASSICs are less expensive than some we’ve seen. So why are they in the premium category? Well, they’re essentially just a clip on extension for your existing glasses. This allows them to be flipped up when not in use, though, so there is an element of versatility to them. These glasses block up to 85% of blue light and completely stops UV400 waves. 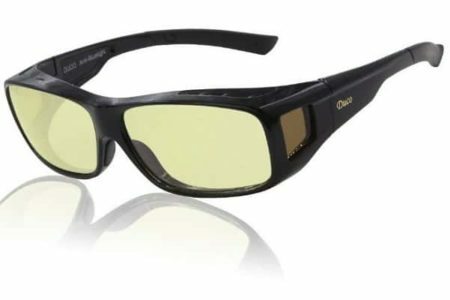 Because there’s no frame, they have a significantly lower weight than the other gaming glasses in our list – this model weighs just 12g, which is excellent however the weight of your existing glasses must also be taken into account. The lenses, unlike most others, are not only scratch resistant, but also repel fog, oil, and stains. After all, it’s hard enough to keep regular glasses clean, so having to clean two sets of lenses would be an annoyance. Luckily, these coatings help prevent this as much as possible. The Gunnar Optiks Intercept glasses are priced at around $50, so you’d expect them to go above and beyond. Thankfully, they do – they combine a sleek, classic frame with some of the best blue light reductions available. Up to 65% of blue light is eliminated, and 100% of all glare, UVA and UVB light. This not only helps reduce dry eyes and headaches but also makes it easier for you to sleep if you tend to work or game late at night. There is a small amount (20%) of magnification too, so it’s easier to zoom in without changing settings for every application you use. The frame is also easy on the eyes but in a different way. It’s a simple rectangular frame that’s black with white trim on the temples. After all, it’s rare enough to see someone taking proactive steps to protect their eyes, so why punish them with goofy looking frames? If you’ve ever gone to see a 3D movie, you’ll know the struggle of using multiple pairs of glasses at once. The models below are among the easiest to wear with your prescription glasses and better yet, they’re all available for less than $40. The DUCO Optiks 8954L glasses have a goggle style design that allows them to easily fit over your existing frames, regardless of their shape or size. We know, this sounds a little dorky, but they actually look pretty good and with three sizes available you can choose whichever fits you best. You don’t have to worry about breaking these, either. Because of their flexible build, they can be bent to extremes before any damage is done. That said, they come with a lifetime breakage warranty so even if you do break them, you can get another pair for free. The great thing about the 8954L is that maintains all of the blue light reduction you’d expect, but manages to add a little extra versatility that makes it easier to accommodate glasses wearers. Sure, they’re not going to be suitable for office work, but for gaming? They’re perfect. 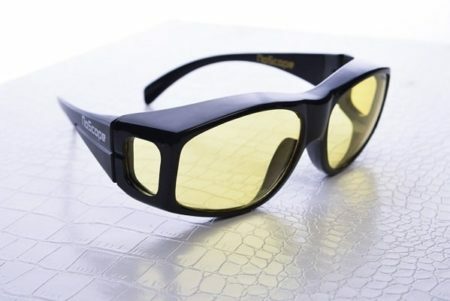 Our next choice, the NoScope Golem gaming glasses, are fairly well known in pro gaming circles. They look similar to the 8954Ls but come with a significantly lower price tag (roughly $15). So how do they hold up, and are they worth the investment? We think so. The lenses in these glasses are coated in resin and help block out glare as well as blue, UVA, and UVB light. This helps keep your eyes healthy and reduces eye fatigue while ensuring that you can continue wearing your everyday glasses. These glasses are capable of taking a beating, despite their low overall weight. The lenses are scratch resistant and the amber tint helps increase your screen’s contrast, allowing you to focus more easily on targets.